Mid-Span High Power 802.3at PoE injector (1 Port, 110V/220V AC input). Ideal for Meru AP300, backward compatible with 802.3af, also works with Meru AP200 and Meru AP150. Includes US power cords. 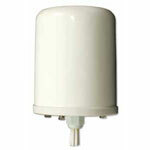 Dual Band ceiling mount omnidirectional MIMO antenna with 2/3 dBi gain, with low profile ceiling mount for indoor applications requiring coverage of multiple bands with minimum visibility. Includes three 3" RPSMA pigtails to connect to a 3x3 802.11n AP. It is designed to be easily mounted to drop ceiling tiles or to a solid ceiling surface where cable routing access is available. Use 1 antenna per radio, for example AP310 will need 1 unit, and AP320 will need 2 units.